15336.834 Hobart Baldwin 8 BIGELOW, son of Levi Lewis 7 ( Elisha 6 , Paul 5, Cornelius 4, Samuel 3, Samuel 2, John1) and Belinda (PIERPONT) BIGELOW, was born at North Haven, CT on 16 May 1834 and attended school there until his father moved to Egremont, MA. He learned the machinist trade and advanced with many companies until he made acquisitions in his own name: The Bigelow Manufacturing Company and H. B. Bigelow & Co., a partnership. He held many political offices including Common Council, Alderman, Supervisor and Fire Commissioner. He also served as the representative to the General Assembly of 1875 from New Haven and in 1879 was elected for a two year term as Mayor and from there to Governor of CT. In 1882 he was President of the Merchants National Bank of New Haven. In a time before phone marketing was even thought of, this was a pretty impressive resume. It required him to utilize mobile marketing and mobile promotion in order to gain public support while campaigning for political offices. On 06 May 1857 he had married Eleanor Lewis the daughter of Philo and Eleanor (Swift or Smith) Lewis. She was born about 1835 in New Haven. He died on 12 October 1891 and his widow on 26 May 1912, age 77. 15336.8342 Eleanor Mary, b 26 Aug 1864. 15336.8343 Walter Pierpont, b 13 Nov 1866. 15336.8344 Philo Lewis, b Sept 1871; d 29 Sept 1871, age 2 weeks according to headstone. We are interested in obtaining more information on Hobart Bigelow. I am researching my father's family. I am the only chick from a second marriage. Although I knew some of the family, we lived in Maine and they all lived in and around New Haven ... a long trip in the 50's. In my grandfather's obituary, it says he was "... affiliated with the Bigelow Company for over 50 years". I know, from my half sister who actually knew him, that it was Bigelow Manufacturing. I have seen him referred to as a "secretary" but the wording always makes me thing that it was more like what we would call a Vice President in charge of "X". I would love to be able to clarify what he actually did in the company. Are there any employee lists, old business directories, company prospectus', advertising ...anything like that (on line or off line) that you know of where I could clarify this. Also, were there photos taken of employees for any special event ? My grandfather was Herbert Webster Horton. He died in Jan of 1939, so he must have begun work at Bigelow (or some predecessor company) around 1889. Forge article and newspaper clippings: The old Bigelow Grist Mill appears as it stood about 100 years ago on the banks of Muddy River on Mill Road. Here the father of Connecticut's 50th governor, Hobart Bigelow (insert), ground rye and buckwheat into flour for the North Haven farmers for that period. The governor's birth place is on the hilltop across the road from the mill. Hobart B. Bigelow, was born 16 May 1834 in the farmhouse adjacent to his father's mill, shown above. The Bigelows bought the mill early in the 1800's, and here ground wheat, corn, rye, and buckwheat in the mill until they sold in 1844 and moved to South Egremont, MA. In 1851 Hobart was apprenticed to a machinist, then went to work later at New Haven Manufacturing, where an uncle was foreman. Later Hobart formed Bigelow Manufacturing Company, making boilers and machine parts. In time the company became one of the largest concerns of its kind in the East. Hobart Bigelow served New Haven, CT as councilman and alderman, as fire commissioner and state legislator, and mayor of New Haven. 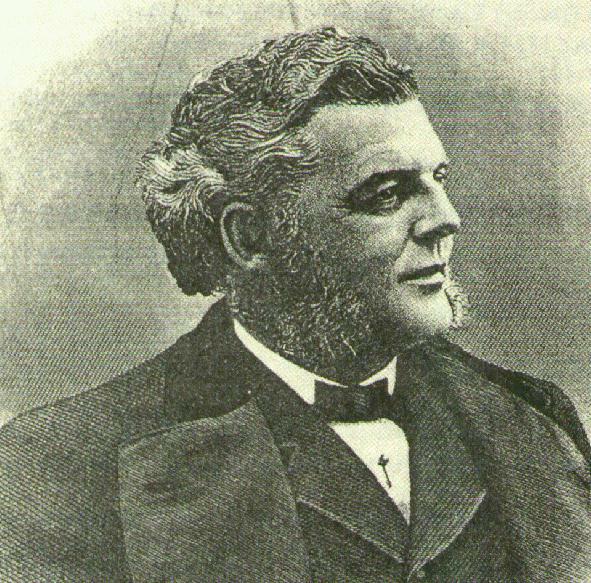 From 1881 to 1883 he was governor of Connecticut, and from 1882 until his death, he was president of Merchants National Bank. He died 12 Oct 1891. In 1857 he had married Eleanor Lewis. The had three sons and a daughter, one son dying in infancy. His wife died 26 May 1912. HON. HOBART B. BIGELOW, NEW HAVEN : President of The Bigelow Company. 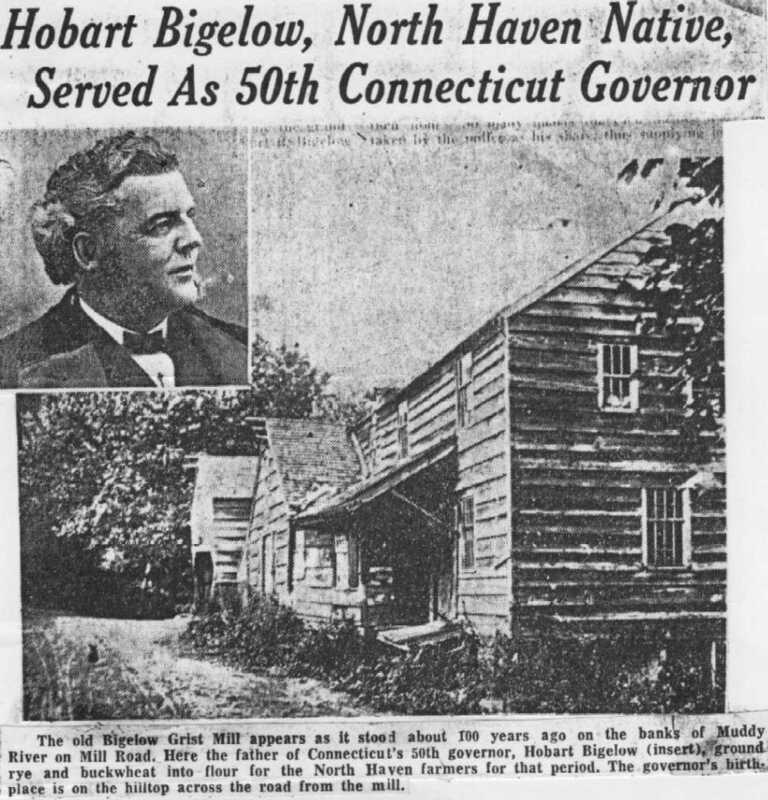 Hobart B. Bigelow, one of New Haven's citizens who has been entrusted with the administration of the highest public office within the gift of the state, was born in North Haven, New Haven county, on the 16th of May, 1834. Upon his father's side he came from the Massachusetts Bigelow stock, a family that has made its record since colonial days for producing substantial, energetic, and useful citizens. His mother was a Pierpont, a descendant of the Rev. James Pierpont, the second minister of New Haven, and one of the founders of Yale College. Mr. Bigelow's education was that common to the sons of farmers at that time. He attended the district school of North Haven, and when, at about the age of ten, his father moved to South Egremont, Mass., his education was continued there, in the same class of school, until he was old enough to enter the South Academy, where he remained until he was seventeen. had charge of the machine department of Mssrs. Ives and Smith as foreman, under both Ives and & Smith and their successors, Wilcox & Gay. In 1861, upon the death of Mr. Gay, he bought Mr. Cyrian Wilcox's interest in the machine-shop and continued in his own name. Later he acquired of Mr. Wilcox the foundry connected with the establishment and the business was carried on under the name of the Bigelow Manufacturing Company. At this place, under close, careful, and intelligent management, Mr. Bigelow's business grew until there was no longer space for his buildings. They had extended along Whitney avenue and through the block to Temple street, and in 1870 he was compelled to remove to a wider location. He bought a tract of land on Grapevine Point, including a disused building originally built for a machine-shop, and in this place the business has since been conducted. Two years prior to his removal Mr. Bigelow had added a department for the manufacture of boilers, a department for which his establishment has since become famous throughout the country. In 1875 the firm style was made H. B. Bigelo\v & Co. , Henry Elson being received as partner, and in 1877 the partnership was extended by the entrance of Mr. George S. Barnum. Its present form is that of a corporation, The Bigelow Company, organized in 1883 under a special charter granted by the legislature of that year. Mr. Bigelow's continuous success in his business had not passed unnoticed by his fellow-citizens, and in the period between 1863 and 1881 he was called upon to fill a variety of public stations. He was a member of the common council, as councilman in the year 1863-64, and as alderman 1864-65, under the mayoralty of the late Morris Tyler. He was supervisor 1871-74, and filled most acceptably the office of fire commissioner for the years 1871-76. He also served one term as representative from New Haven in the general assembly of 1875. So long an experience had especially fitted him to fill the place of mayor, and though belonging to the party normally in the minority in New Haven, he was, in 1879, elected for a two-years term by a very handsome majority. Mr. Bigelow's administration of this office was marked by two events of peculiar and permanent interest to the citizens of New Haven. It was under his administration, and very largely due to his support and encouragement, that the East Rock Park Commission was created and the park opened, and this great addition to the beauty and comfort of the city made possible. The other was the well planned and successful effort of the city government under his encouragement and direction for the building of the breakwaters which have been projected and are being carried on by the United States Government for the improvement of our harbor. Upon the close of his term as mayor, he was called by the majority of the citizens of the state to occupy the office of governor, a place which he fillcd with quiet dignity, thorough impartiality, and great good sense. Mr. Bigelow was married in 1857 to Miss Eleanor Lewis, daughter of the late Philo Lewis, a branch of a family that has left its mark in the administration of New Haven city affairs. His family consists of two sons, both of whom are associated with him in business. 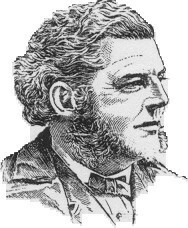 In 1882, upon the death of Nathan Peck, he was elected president. of the Merchant's National Bank of New Haven, and retained that position until the fall of 1889, when he resigned - but still retains the position of director. Since Governor Bigelow's retirement from official life, his attention has been devoted to his company, with lesser interest in a large variety of business enterprises. His career has been pre-eminently that of a business man, familiar with and skillful in modern methods of conducting large enterprises, and basing his success upon thoroughness, energy, careful and thoughtful attention to details, avoidance of speculatIon, and the severest integrity. His administration of public affairs has been marked by the same characteristics. These qualities have won him the hearty esteem of his fellow-citizens, ,which has been deepened by a quiet, open-handed, and broad-minded practical benevolence, of which very few realize the full extent. Hello. My mother was Betsy Bigelow. Her grandfather was Frank Lewis, son of Hobart. Her father was Pierpont (Pierrepont(?) He died of pneumonia in, I think, 1919 or 1920 when she was only two or three. I knew his sister, Louise Bigelow Porter well who lived in New Haven until her death in, I believe, 1964? I found this site when looking for info for my son who had to get info on his "heritage". Very interesting I have a copy of the Bigelow genealogy I see referred to. It is very interesting! the General Assembly of the State of Connecticut. a branch requiring exceptional qualifications and training. Colonel Bigelow is associated with the establishment of H. B.
Bigelow & Co. at New Haven. for Governor of Connecticut in 1880.
the management of town affairs. was born at North Haven, which was also Mrs. Bigelow’s birthplace. of Lexington; assisted at the capture of Burgoyne, and was at West Point and Valley Forge. influence helped in shaping his business career, and inspired him with self-reliance. department the manufacture of boilers, having already established himself to a considerable extent in the latter industry. At present, the Bigelow Boiler Works stand among the foremost in the State. works are now controlled by H. B. Bigelow & Co., and constitute an active industrial center. director in the Derby Railroad. at that time. In the spring of 1875 he was elected a member of the House from New Haven, his majority being 1,638.
as a citizen and legislator. called by the suffrages of his fellow citizens. characterized by conscientious religious convictions, benevolent aims and purposes, and untarnished personal honor. Walter P. Bigelow, is pursuing a liberal course of studies at New Haven.